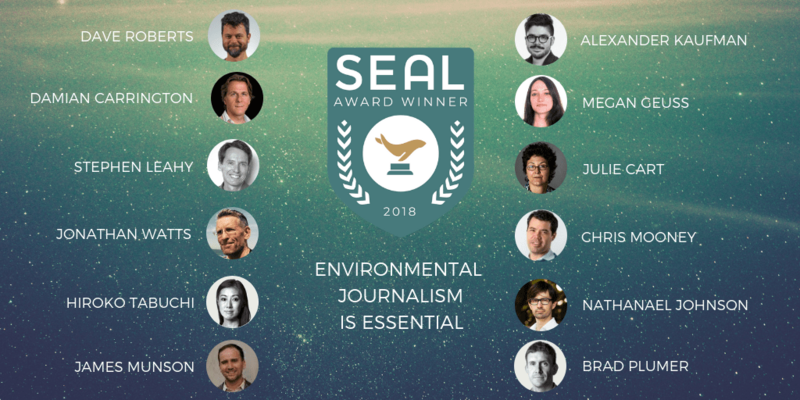 November 12, 2018 – With our environmental crisis an existential societal issue, twelve journalists have been awarded a 2018 SEAL Environmental Journalism Award, celebrating their work in documenting climate change impacts and solutions. Honorees include four repeat winners: Brad Plumer of New York Times, Chris Mooney of Washington Post, Damian Carrington of The Guardian, and Dave Roberts of Vox. First-time SEAL Environmental Journalism Award recipients include Alexander C. Kaufman of Huffington Post, Hiroko Tabuchi of New York Times, James Munson of Bloomberg, Jonathan Watts of The Guardian, Julie Cart of CALmatters, Megan Geuss of Ars Technica, Nathanael Johnson of Grist, and Stephen Leahy, a contributor to National Geographic and Vice. With all writers covering the environment eligible and under consideration, winners were selected based on a panel review of each author’s work, peer nominations, and were chosen based on alignment with timely environmental topics and issues. The 2018 SEAL Environmental Journalism Awards were chaired by Sasja Beslik, Head of Group Sustainable Finance at Nordea and an internationally recognized sustainability thought leader. You will ONLY receive email notifications regarding the 2019 award announcement. Our core beliefs maintain that environmental progress requires leadership, leadership deserves recognition, and recognition is a form of accountability.